if your cable becomes defective without any man-made damage. hours, just contact us at your order page, click write to seller. output current is less than 2.4A) for charging. Make sure the connector and the port is dry before you plug the cable into your devices. 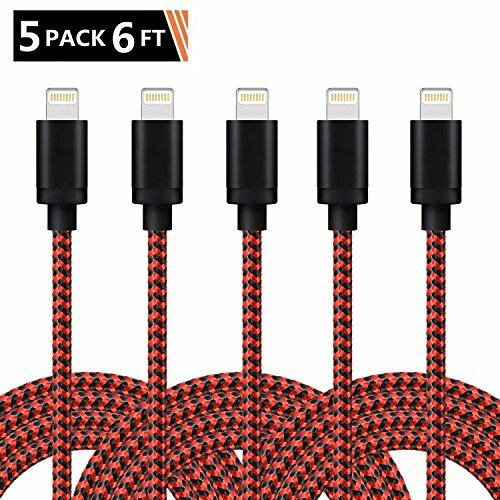 Great Value (free warranty): A great combination of quality and price for 5 packs lightning cable, and we guarantee your purchase with FREE 1 year warranty. Perfect Length: 6ft is not too long or too short for your daily use. You can feel free to charge your device with any comfortable posture you like, lying in bed,lying in sofa etc. More durable: Nylon braided cloth sheath makes the cable more durable than your original plastic charging cables, at the same time it is also flexible to coil up, tangle free. Safe & Fast Charging , Syncing Experience: According to our numerous testing, our cables can charge your phone fully in about 2 hours. It works like original iPhone cable.